Don't forget the "Fun Food"! Concession equipment rentals are a favorite all across the Tallahassee area. These concession machines are just like the ones you'd see at a movie theater, or State Fair. When you rent from Bouncers you can be sure that your concession rental has been cleaned and sanitized and will be ready for your guests upon arrival. 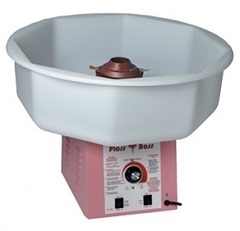 Just like at the state fair, you can create that carnival midway atmosphere with a classic cotton candy machine rental. 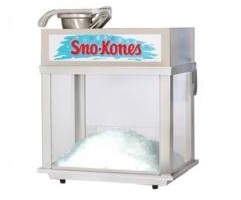 This concession rental is sure to please and bring back great memories for your adult guests. It's easy to operate and your guests will keep coming back for more, so make sure you also have enough supplies for all. Remember to order supplies based on your expected guest count with extra just in case. Includes supplies for 100 servings with one gallon flavor. 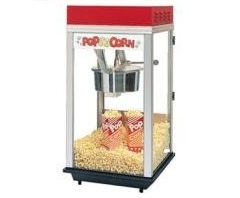 Not just any popcorn machine rental, this classic design not only adds the aroma of fresh popcorn, but also serves up a carnival look that adds to your party atmosphere. It's easy to operate and your guests will keep coming back for more, so make sure you also have enough supplies for all. Includes Servings for 125 guests. Additional supplies available upon request. Call for pricing. Convenient for any gathering where extra seating at the table is needed. 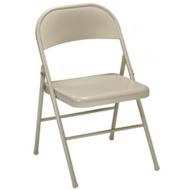 These folding chair rental units have an easy clean metal seat with steel folding legs. Easy to move and store. Convenient for any gathering where extra table space is needed. 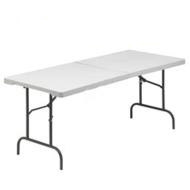 These folding table rental units have an easy clean table top with steel folding legs. Easy to move and store.